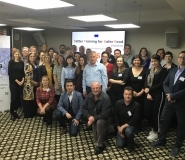 Ag-Lab aims to improve the quality control of agro-food products in three recently associated EU member countries (Georgia and Moldova and Ukraine) by improving upon the training of their specialists . The project deals with the part of the Agreement related to food and agricultural products safety which can be ensured through appropriate laboratory control of EU legislation and standards. The project is coordinated by the University of Ljubljana (UL), Slovenia and involves HEI partners from Ukraine, Moldova, Georgia, Poland and Italy & France. Ag-Lab will provide its stakeholders with a new approach to teaching specialized courses through laboratory practice for specialists of the agro-food sector in the partner country HEIs. This will be achieved through the permanent exchange among teachers, laboratory specialists and their EU colleagues via the Ag-Lab Moodle portal.